Zahara de los atunes, Costa de la LUZ - Andalusia, Spain. Zahara de los Atunes is a part of the town of Barbate and which, along with the latter town, separated from Vejer de la Frontera in 1938 and which has been since earliest times the most important centre on the coast for the fishing of tuna in the style of the Almadrabas, hence its name. One of the principal charms of Zahara de los Atunes are its beaches, which is scarcely surprising since from here one can enjoy the most beautiful sunsets and clearly see Africa on the horizon. 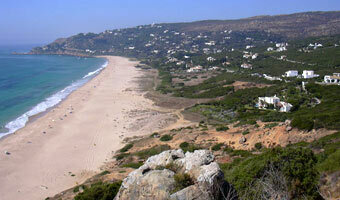 Zahara de los Atunes is a beautiful fishing village. It is a location where you can enjoy the tranquility and beauty of its beaches, try exquisite snacks and meals in its large variety of bars and restaurants, enjoy the quiet and informal environment of its food stalls and "copa" bars, go horseriding on the beach at dusk or simply stroll and look at the craft in sight. Its 7 kilometres long fine golden sands accompanied by crystal clean crystalline waters extend from the village of Zahara de los Atunes to the cove of cabo de Gracia, cover all the centre of Zahara and Atlanterra. As if this were not enough, it is also one of the few locations where bothe the green of nature and the blue of the sean can be found. Its waters, in addition to being clean and crystalline are also cool and should be bathed in, because once you try it, it is glorious.